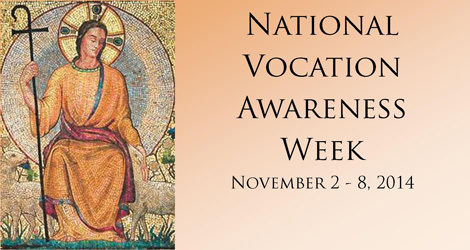 Next week, in recognition of National Vocations Awareness week, we will celebrate St. Dominic Savio’s own “Vocations Blowout Week”. Throughout the week we will be praying to hear and respond to God’s call in our lives. We will be praying for vocations to the consecrated religious life. We will be celebrating this day with a saint dress up day because it is the first school day after All Saints Day. You can dress up as your favorite canonized saint, ladies come up with your favorite religious sister or married woman saint. Gentlemen, dress up as your favorite religious brother, priest, or married male saint. All saint costumes must conform to dress down expectations- no shorts, skirts, tight clothing, etc. We have Mass as a community (normal Wednesday schedule). We will be praying for all vocations as well as the Universal Call to holiness. We will be praying for vocations to the dedicated single life. We will have the special privilege of hearing a special presentation during assembly time. We will be praying for vocations to the married life. We will bring our week to a close with exposition of the Blessed Sacrament. This year's edition of Savio football is unlike any other. 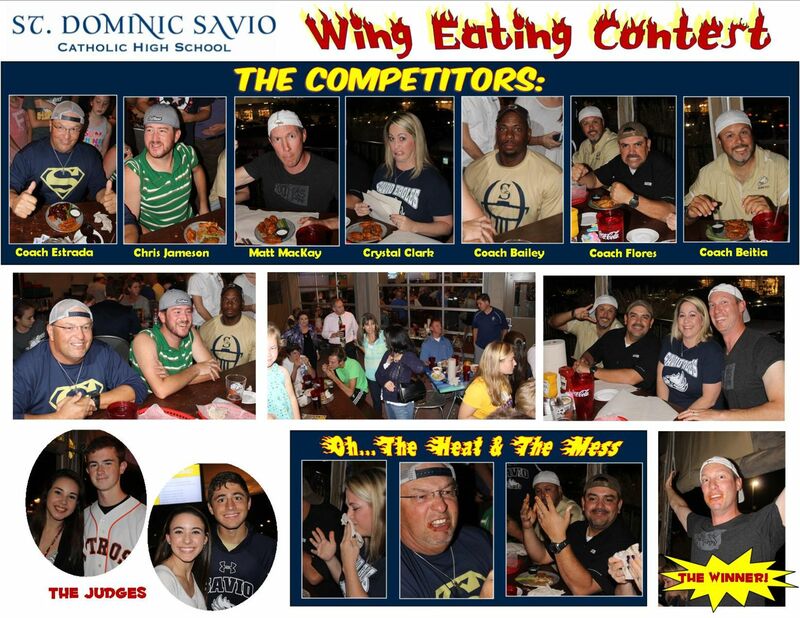 Friday night's convincing 55-7 "white-out" homecoming win was not only the first homecoming win for a Savio football team, but they also now sport a current winning record of 4 wins and only 3 losses. The outcome of the homecoming game was never in doubt as the Eagles scored on the very first play of the game. Senior Sam Alvarado took a handoff on the right side and sprinted 65 yards for the score. On the Eagles' next offensive possession Alvarado scored again from 18 yards out, and from that point on the Eagles never looked back. After taking a commanding 48-7 lead in the third quarter Coach Joe Gutilla emptied the bench, and the homecoming victory celebration was on. This Friday Savio will travel to San Marcos to take on the San Marcos Academy Bears at 7:30. Lots of folks came out to join us for a wonderful spirit night at Pluckers on Lakeline blvd on Wednesday night. Some "surprise" guests showed up for the wing eating contest to make for a great show. Congratulations to Matt MacKay for finishing first! CLICK HERE FOR PICTURES !! Thank you to all that came out to support the Eagles! What a fantastic day filled with great folks, great weather and good fun! What blessings for our school. We raised over $7000 for our athletics dept and we are not finished with our raffle yet. We had 48 golfers and 68 folks for lunch. This tournament will only get better and better with all of the great folks that came out to volunteer their time, donate items, golf, be a sponsor. There are so many wanys to help and many, many folks jumped right in. Thursday night the Lady Eagles and Reicher squared off in a district match. This was also Senior night for Abby Siordia and Jordan Brannam, who both took the Savio floor for the final time in their careers. The Lady Eagles took sets one and two with scores of 25-18 and 25-21. Then they dropped set 3 by a score of 20-25. After falling behind in set 4, All-State softball player and senior right side Jordan Brannam stepped in and delivered 3 ace serves to bring the Lady Eagles back in striking range. The Lady Eagles stayed poised and stormed the rest of the way, winning the 4th set 25-17 and the match. Junior setter Sarah Greiner dished out 39 assists, while senior Abby Siordia and freshman Isabella Young each dug up 15 hard driven shots each. Sophomore Maddie Miksch pounded 16 kills to the hardwood while Junior Hannah Parker delivered 8 kills. Parker and Miksch each had 5 and 4 blocks, while freshman Olivia Ramirez, senior Jordan Brannam and freshman Isabella Young each served up 3 aces. Playoff hopes are still alive for the Lady Eagles as they prepare for their final regular season match next Tuesday against St. Michael's. A special thank you to all the Savio fans, you're the best! Our first Booster Club golf tournament is scheduled for Monday, Oct 20 @ Forest Creek Golf Club! There is no school that day and teams are still forming! We would love for you to come join the fun. You can register your foursome HERE! There will be silent auction, raffle, games and prizes! Our student athletes and booster club supporters will be on hand to make sure you have everything you need to enjoy your day. The St. Dominic Savio Eagle offense has a penchant for starting slowly in their games, and Friday night's game against Eastside Memorial started out like most. The first two offensive possessions ended in fumbles, but the Eagle defense stood firm and held the Panthers twice inside the Eagle 15 yard line. Coach Joe Gutilla gathered the offense together prior to their third possession, and whatever was said seemed to provide the spark the Eagles needed as Savio rolled to a convincing 38-6 victory. Defensively the swarming Eagles punished the Eastside offense. Only a wayward Savio pass in the third quarter led to the Panthers only score of the game. Savio amassed 507 yards of total offense for the game led by senior Sam Alvarado's 170 yards rushing. Alvarado's performance broke the Savio school rushing record. The win moves Savio to 3-3 on the season. The Eagles will now have two weeks to prepare for their homecoming game on October 24th vs. East Austin Prep. Friday night the Lady Eagles Volleyball team overcame a 1 set to none deficit in a 4 set victory over the Lago Vista Vikings at home. After losing the first set 25-23, they won a tense second set 26-24, then won the next two sets 25-17 and 25-19. Overall, the Lady Eagles had 15 blocks, with Junior Right Side Christionna Hawkins roofing Lago Vista's outside hitters 5 times, as well as hitting at a sizzing .333 attack efficiency. Junior setter Sarah Greiner dished out 35 assists, delivered 3 aces, 5 digs and 5 kills, while Sophmore Outside Hitter Maddie Miksch hammered 19 kills, 3 blocks, 2 aces and a season high 17 digs. Sierra Martinez and Natalie Stewart each had 11 and 10 digs respectively. Next Tuesday the Lady Eagles are on the road for a district match against Regents. The Eagle football team notched their second win of the season on Thursday night as they cruised to a 34-8 victory over TSD. Savio jumped out to a 7-0 lead early and held onto that score just before halftime. TSD scored late in the second quarter, but the Eagles turned away the Rangers' 2 point conversion to go into the locker room with a 7-6 lead. The second half belonged to Savio. The Eagle offense jumped out to a 27-6 lead in the third quarter and never looked back. After posting one more touchdown in the fourth quarter to go up 34-6, TSD managed a safety late in the game to make the final score 34-8. Seniors Sam Alvarado, Spencer Supnet, Brian McNaughton, and Sean Casey led the way for Savio. The win moves the Eagles to 2-2 on the season as they look ahead to play Eastside Memorial on Friday at House Park at 7:30. On Wednesday, October 1st, Savio participated in the One Rose Invitation. Some young women were invited to think about discerning a religious vocation when TimTeam members Callen and Caroline, gave them a single white rose. This practice is part of the Imagine Sisters Movement. Remember as Fr. Jonathan said earlier this week: If the King of the Universe is asking you out -- you don't want to get in HIS way! Come join the sisters for some fun, fellowship, and time with JESUS in all night Eucharistic Adoration. Please keep all young women who will be attending the discernment retreat in your prayers. Savio Eagles Swimmers had 100% attendance at the season opening Round Rock HS swim meet Thursday. Despite being the smallest team and first meet nerves, there were some very good individual and relay team performances. Coach Chris encourages Savio students with swimming experience to join in on the fun and help the team fill out the roster so that all the events can be covered at a meet. Go Eagles!